Though, it was not as it seemed. Immediately Folka was aware that she was weaponless as she watched her yox get dragged through the crunchy snow. There must have been three thieves, their shadows barely visible in the night, and sounds from the barn suggested more. Folka had nothing with which to attack, but that’s never stopped a lumberer from fighting. Though the preference was strategy, she had learned to be resourceful. This would not be the first time it saved her. An enormous bulk dashed into them first, bowling into the mass and leaving deep gashes in the ice-crusted snow. It was impossible to tell the ruckus from itself, all screams and growls and the yox’s wails. Folka did not slow her pace, but leapt into the fray, twisting the first arm she saw and releasing leathery reins from its grip. It was mayhem and the yox reared back, the yoke catching a brigand in the gut and Folka in the face. Her blood joined the others in the moonlight, splattering on a sword she wrenched away from the wielder, hearing the pop of his wrist breaking under her force. The barn was not in great repair before the night began, and Folka saw the shadow just before the roof crashed down by her side. Groaning, the rest of the structure could not hold as remaining brigands slammed open the doors and fled. And slammed it onto the outstretched heel of a brigand, causing him to drop his sword mid-thrust. Reactively, she hefted the barn door and crashed it to the ground, sending a flimsy buckler skidding across the ground. At her side, the white creature kept its stance ready to charge. But there was no longer anything to fight. The night smelled like pine and iron. She felt she owed him no thanks nor explanation. His appearance was a boon, but it did not save her yox nor her livelihood. At least there was good meat to be had, and she would get another animal somehow. He stretched his arms and tossed a tightly-bound leather package to her feet. Folka didn’t need to open it, she had made it herself. It contained a cloth and salve, but she had no intention of using it, just as he had not. 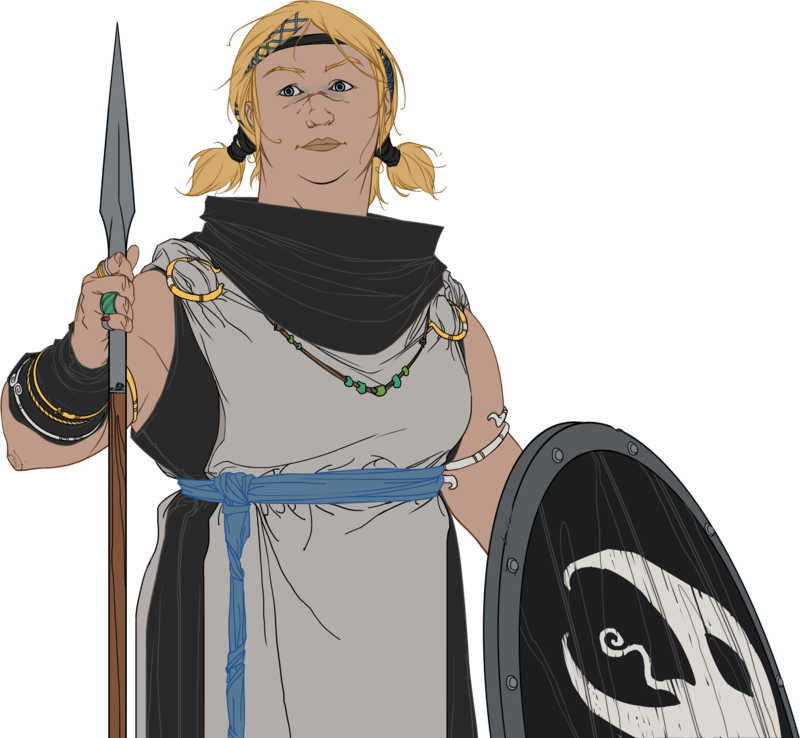 Folka had fought her brigands with a broken nose, and did not find it as difficult as the town stories said. The land was frozen around them, so the yox would keep until morning until she was ready to prepare the meat. But dinner was on, and the warmth of the house beckoned her. Gathering an extra log for the fire, she walked back to the open door of the house. The bear-man had not moved, still surveying the night that held no other disturbance. He looked feral and fearsome, but something in him had placed him there. The gods may be dead, but their work was ever an enigma. Folka walked back into her modest family home, remembering how many people it once held around the table, remembering the ordinary sound of living. A hulking shadow appeared at the door and for the first time in a year, she fetched two plates for the table.